Why do Coalition PMs keep conferring titles on themselves that they patently do not live up to? Abbott was the Prime Minister for Women, Indigenous People, and Roads. We thought Turnbull was going to be man who would refuse to lead a party that wasn’t as committed to action on climate change as he was – which turned out to be not very – but he dubbed himself the Prime Minister for Innovation instead. The Coalition government want to claim credit for legislating an end to discrimination in the marriage act at the same time as they also want to enshrine in law the right for anyone who disagrees with it to continue to discriminate. The Prime Minister for Standards and his team believe in the sanctity of marriage – except for the part that says “to the exclusion of all others”. The purpose of marriage is for procreation and it is crucial for children to be raised by their biological parents – unless they are Indigenous or the children of Hugh Jackman. They want to claim credit for handing out drought assistance money whilst enabling water theft and rampant land-clearing and denying climate change. Subsidies for renewables are evil but subsidies for fossil fuels help keep people working. When it comes to an Australian citizen who has never applied for citizenship of another country but who may have been eligible under certain conditions, which he doesn’t satisfy, that is sufficient to convince the PMS that they are indeed a citizen of the other country – but any politician who has not applied for citizenship even though they are eligible is definitely not a citizen of another country. 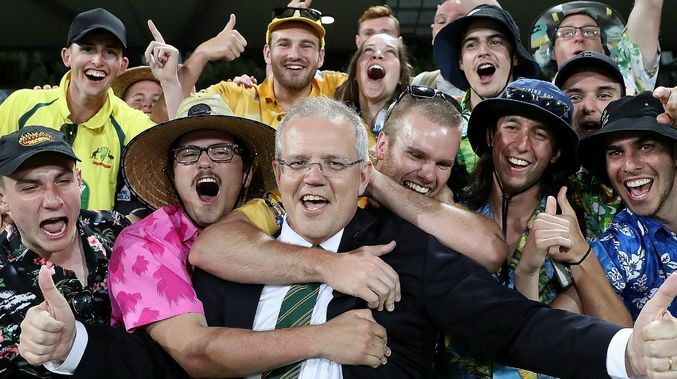 The baseball-cap wearing PMS has announced a dress code for citizenship ceremonies which must be held on Australia Day, or another day in September, or whenever a Greens MP or Senator chooses to. Meanwhile, real Aussies will drag out their flag cape, get pissed, and go look for someone to bash. No doubt Promo will be cooking a strawberry curry on the barbie while Jen rolls out the pav she cooked earlier. And there will be some passing acknowledgement of the traditional custodians of the land whose successful management for 50,000 plus years was much appreciated but aren’t you lucky we came along. Income management will empower you, truancy officers will instil a love of learning, mandatory sentencing and imprisonment for unpaid fines will stop adults from being poor – we’ll look after the kids. And if they play up while you’re gone, we always have places like Don Dale to help teach them to be good. ProMo really cares about kids (if they don’t express opinions). So much so that he will publish a list of pedophiles complete with photo and address – what could go wrong? But we won’t be doing pill-testing because that would just make kids think it was ok to take drugs which they certainly don’t do now. And we won’t be taxing alcohol or sugar because that would be bad for profits of hard-working mum and dad investors. Australia is the most successful multicultural society in the whole wide world – in fact I hear the Saudis might have an award up their sleeve for a certain Minister or two. And isn’t it great that the Saudis are willing to help with Jobson Groethe by buying weapons from us. National security is a priority for our PMS and his sidekick, P Duddy (who must wish Sophie Mirabella was still there so everyone would stop hating on him). In order to keep us safe, they will stop letting any more Muslims or people with black skin into the country and they will make the ones who are already here too scared to go out and definitely too scared to express an opinion, or to not express an opinion. They must worship Australian values of free speech and stop being such snowflakes about Mussie bashing and Neo-Nazi rallies against African kids. And NO, we are NOT racist and don’t you dare say we are! Religious freedom is a right of all Australians as is the right to stop any mosques being built. Anyway, Islam isn’t a religion. And how can Jews claim to be Aussies when they won’t eat a bacon and egg roll? They should be forced to eat a pie and scull a beer at the citizenship ceremony like way too many politicians do. Will Andrew Laming do his usual gig of gate-crashing parties with a tray of lamingtons and do his party trick of drinking a beer whilst doing a handstand? Will he send out another Australia Day greeting with a photo of the boys showing their bits? It may be a tad difficult for New Australians to get a handle on these Standards the PMS is espousing. My family has lived here for eight generations and our current government in no way represents the standards and values I respect or those that could actually make this country a place worthy of celebration. The photo says it all. Bogan rule. Oh, that PMS … vote early, vote often, get rid of the carbuncle. And NO, we are NOT racist and don’t you dare say we are! And we have some Uncle Toms and Aunty Thomasinas on the payroll who will front up for the cameras to confirm this. Promo reminds of the NT comments about the hierarchy being “whited sepulchres”. ProMo, the man of the people, flies around the country from one stage-managed photo shoot to another, always meeting with a hand-picked group of loyal supporters to show Scott is listening, hearing, and doing. Of course, he is currently trying to convince Pacific Islanders that to step up, you have to turn up, and to turn up, you have to show up. Which I think means hey, I’m here. Hurry up and take a photo so I can get back to higher ground. Back at home, those of us who have a go will get a go. Want to build a huge casino with luxury accommodation on the foreshore of Sydney Harbour for foreign gamblers? Sure! Money-laundering, rigged pokies, foreign bribery and illegally trying to solicit high rollers in China concerns aside. Anyone having problems with unions? And for those of you who run a bit short on cash, declare yourself bankrupt and start again. That’s what easier bankruptcy laws are for. Or you can just wait it out and spend everything you’ve got because you can’t find a suitable free legal team other than your partner. Coming up, the next instalment in Jacksonville. … and now we have the debacle of the Barrier Reef Foundation debacle to add to the Murray Darling Basin Authority (MDBA). The Barrier Reef Foundation debacle can be blamed on Malcolm. About 50 percent of the reef’s coral cover has already been lost, and the generally agreed-upon estimate is that it all could be gone by 2050 unless major action is taken. The MDBA is further evidence of a failure in governance by the LNP. Splitting the MDBA into two, with a Regulator may help. The real issue is the question of trust. Does anyone really trust anything our politicians say or do? Australians are not alone in trying to answer this question. Glaring examples in USA, UK and other Western countries abound. See Brexit, for example! What is causing this loss of trust? World War II was won by British brains, American muscle and Russian blood. After World War II, it was decided that British Brains and American Muscle would rule the world. Then came 9/11 where we saw Israeli Co-ordination added to the formula. Now it looks like we have British Muscle, Israeli Brains and American Co-Ordination! Does that help to answer the question? VICE, the movie is a must-see! You covered a lot of ground there Kaye Lee and showed just how unfit for the job Morrison is. I cannot believe how badly the last 3 LNP PM’s have been. What a shower. If a Labor Government is not elected, this country is going to be stuffed. Kaye Lee, he is evangelising. What else can a person as obstreperously bereft of the desire to acquire real knowledge ad to make an effort to apply it to the neglected but fundamental policy field do? I really hope the public doesn’t reelect him and his coterie of obnoxious morons to government, they are very dangerous people. I hope the disastrous NSW government is banished also. What is the count now of politicians fornicating a river system and their staff members? Can a Minister use Parliamentary privilege to protect a family member from prosecution in the principle area of the Minister’s portfolio? Congratulations Kaye Lee, you’ve done it again!! Kaye, your use of the term “stage managed” says it all. It was the same with Abbott. Morrison and Abbott – both with the personalities of a dead frog – need/needed to be stage managed to protect them from their true selves. Morrison and Abbott – two men who refuse to accept scientific evidence of climate change and who both dispute evolution in favour of creationism. Not a good mix ! Has one noticed that Morrison gets that silly smirk on his face when caught out, when the media insists on asking appropriate questions. Reminds one of little boys smiley smirk when caught out doing wrong. Morrison appears to be about playing the role of PM, not about being. The Minister for Standards et al, are using Anning I think, much like they did Hanson. On the “I Hate Christopher Pyne ” page, posts are suddenly being reported, and deleted. Someone from the LNP is not happy. And ITS going to get much worse. Freedom of Speech? Yeah….nah…. Because I have nothing better to do, I read some of the nonsense on Anning’s FB page (it’s true I need to get a life). I didn’t get far, just to the entry where Anning claimed Australia would be overrun with Muslims by 2045. The 2016 census shows Australia’s population as 23.4 million, of which 2.6% declared themselves as Muslim, that’s 604,200 people. How will a nation of 23.4 million become Muslim in just 36 years? “We reviewed Senator Fraser Anning and found content on the Page that doesn’t follow our Community Standards. We removed that specific content (example: photos, posts) instead of the entire Page. Perhaps he is taking revenge? Most of the people on Annings page don’ t have two brain cells to rub together. As for the comment I made, the man I responded to just didn’t have a clue. Or pretended not to.There are even Aboriginal people ( perhaps, although I doubt it) agreeing with his monstrously stupid throwback policies ( if you can call them that) when his ancestry is linked to his forefathers hunting Aboriginal people for sport! And they continually cite ” Australian Values” which NONE of them are able to define for me. The only reason I go onto that height of stupidity webpage is to prove that NO not all Australians are in agreement with Anning! Morrison and Dutton have released this monster- and will use it to their advantage! So much for being Christian. They are playing both sides of the field. It sickening. Wouldnt he self righteously squeal if people tried to dump cannabis, say, on Aussie streets? The Indigenous Affairs Minister, NigelScullion came out on telly news as diametrically opposed to Jim Hacker’s latest brain fart. Morrison being a member of the US of NA cult of evangelical Christians means to me that hypocrisy comes naturally to him. Scumo is double the prime minister he thought he’d be. If you think that the result of the next election is a foregone conclusion, don’t ever read the daily terrograph as I did, by accident this week. If this rag is the major source ‘information’ for vast numbers of voters, we are in for a shock. Hopefully, most ‘readers’ will go straight to the sports pages.On the way, they will read the headlines, and the paper’s aim is met. That is exactly what my husband does Peter F and you are right. He loves the sports coverage but he tells me some outrageous things where he didn’t actually read the story but got the gist. Miranda Devine loves to stoke the same fire as Mark Latham that any talk of domestic violence is man-bashing designed to make little boys feel bad about themselves, constantly reminding us that women do bad things too. Yes that’s true, but if you are trying to fix a problem, you start where you can do the most good. Men walking along the street rarely get attacked and killed by women. I know I am on a “hiding to know where” on this issue…and I can accept that change of some kind is needed…but it may be already too late…perhaps in this age of equal ability in handling modern weaponry, women need to take up arms!.. But see…there always were subtlies to this terrible problem..
Red K: “Ha! Ha!…yes, guilty I plead! A hundred times guilty! But what would you ; rather perhaps I left such injustices fester unchecked over a dozen generations? Such crimes agin’ a nation must be answered or that nation forfeit its right to statehood….but look not for the splinter in mine eye fair maiden, (sarcastically), what sweet serenading did fall like sugar-drops into the children’s ears whilst thou cradled them to thy bosom? Quoth I: ” Ah there mother’s little man, hmm? are you mother’s little man?…yes we are, oh yes we are!” (mimics tickling action and tone of voice) Gently doth she finger his brow and fixes the gaze of adoration into innocent eye that so enhances the words and impress deeply the insinuation!……Quoth I: (after a fall or scrap’d knee):”There’s mother’s brave little man, You’ll show your mother how brave you are. ” or words to the effect, so does subtlety shape the spirit of the child, quiet whispe’d while with labour’d hand, the cradle is rock’d so does the wilyness of a woman succeed. where crude aggression of a man fall short…(suddenly stops the mimicry).but I am telling you nothing you do not already know with your own intuition….enough! I have no more business with you, go and give heart to the living, your voice is still heeded, mine (turns sadly away); dead!” . . . Yes. I too have reported numerous posts on Anning’s page- and had some banned- others not. I mean, a racist page, with mostly racist remarks- what could possibly be wrong with that? I just take a deep breath and think to myself; what is more irritating than a tiny mosquito, buzzing around your head, and getting in a little sting now and then? We love an underdog; we eschew the overconfident combatant. Therefore, particularly in Australia, no victory is a certainty. Many a slip twixt the cup & the lip … counting chickens? … tempting fate, maybe? The current mob may appear to be losers but premature whoops of victory echoing around the chambers of the AIMN may raise a warm smile from us but alienate the underdog-loving, braggard-hating swinging voter or compulsive informal voter. Don’t forget about the young people. The Coalition, through insisting on a plebiscite, made a lot of young people enrol to vote. They have also really annoyed them by telling them to get back to class and leave the politics to the grownups. Young people don’t listen to shock jocks or Sky after Dark or the Murdoch press. Young people don’t hate asylum seekers or migrants – their friends come from many different ethnic backgrounds. Young people want action on climate change. Young people think education is important. They may have stirred up a hornets nest and some of those people who vote informal might just pay a bit more attention this time. “Today, Australia confronts a trauma – an abomination – hiding in plain sight for far too long. Why did those who know cover it up? Why was our system of justice blind to injustice? Why has it taken so long to act? Why were other things more important than this, the care of innocent children? From the same speech, this wretched specimen apologised for the egregious wrongs committed by Australian governments over decades. “Mr Speaker, today, as a nation, we confront our failure to listen, to believe and to provide justice. And again today, we say sorry. To the children we failed, sorry. To the whistleblowers who we did not listen to, sorry. To the spouses, partners, wives, husbands and children who have dealt with the consequences of the abuse, cover-ups and obstruction, sorry. It was also in October, that ACOSS produced its 2018 Poverty Report. • One in eight adults and more than one in six children are living in poverty. • Many of those affected are living in deep poverty – on average, this is a staggering $135 per week below the poverty line. It was but a few months later that children across Australia, through no other misfortune than the accident of their birth, had to rely on their parents and custodians to seek help through charities to enable any celebration of Christmas, let alone put food on the table, due to their own governments refusal to offer any ‘care of innocent children’. In years gone by, various charities have had sponsorship programs to allow those of us in the ‘first world’ sponsor children in the ‘third world’, children who suffer the unnecessary, disproportionate burdens of poverty due to the accident of their birth. This is the first year that I can recall where Australians are being invited to sponsor Australian children, such is the ongoing neglect of our government. There is the Smith Family. There is also a program from ‘Barnardos Australia’. Save the Children, a group normally associated with championing the causes of children in third world countries, now have programs for Australian children. Double standards doesn’t begin to describe it. That this craven fool does the unspeakable whilst cowering behind his religion speaks volumes. In the dying days of a dying parliament, this walking obscenity presided over the passage of the ‘Modern Slavery Bill’. What was clearly intended as a lily livered attempt to pretend to stamp out slavery became nothing more than another series of weasel words with no other intent than to redefine slavery. Even in draft stages, the loopholes were large enough to eradicate the intent. Their commentary on the act is polite, if not restrained. And now the offense known as Scummo tours the Pacific, representing a scheme known to enslave impoverished Pacific Islanders as much as backpackers as a laudable and generous granting of a temporary right to work. This walking absurdity represents ‘military assistance’ as ‘foreign aid’, and is then offended when he is rightly called out on it. Timor Leste is also critical of our ‘foreign aid’, and that’s before you even start on the Howard/Downer criminality now being played out in Court through the prosecution of the whistleblower. Double standards? You are clearly a kinder soul than I. Therein lies my hope, Kaye Lee. In conclusion, this report has established, in a preliminary manner, that a wide range of political activities experienced in schools or during adolescent years in community organizations, can have beneficial effects on attitudes towards, and intentions to engage in adult political behaviour, such as voting. Therefore the experiences of young adults in secondary school are crucial determinants, as we see it, to the kind of politically aware and active citizens they become as mature adults. From the table, it is clear that female students were more likely to have participated in the “normative” actions, namely signing petitions, collecting signatures, taking part in rally/demonstrations, and writing letters or contacting the Prime Minister, members of Parliament, or the media. On the other hand, the males by far are more likely to have experienced the “non-normative” or more violent activities. This again, is consistent with previous research findings. As I am an avid fan of yours, I am reticent to object to your rapid reply (8 minutes!) to my comment of 9.16am yesterday. When you say: “don’t forget about the young people”, you seem to have incorrectly inferred that my comment ignored young voters. My comment applied to ALL age groups each, of which includes a small but potentially significant number of tall poppy cutters and “underdog-loving, braggard-hating swinging voters or compulsive informal voters” that are not detected by the polls until the last minute. There must be an advantage to be able to claim the underdog status particularly when the other side has already allocated ministries and the best office space. There is another element to this particular election that is relevant to “we can’t lose this one; it’s a shoo-in” narrative. In the past 60 years, there have been only three instances of Labor converting Opposition to Government: 1972 Whitlam vs McMahon; 1983 Hawke vs Fraser; 2007 Rudd vs Howard. Now we have Morrison vs Shorten. What could go wrong? I certainly agree that nothing is a foregone conclusion Geoff. I was absolutely convinced that Labor would not dump Gillard. I was wrong. I though Abbott was unelectable. I was wrong. I said there was no way the Libs would knife a sitting PM. I was wrong twice. Politics is a crazy world and I am expecting this campaign to be particularly unedifying.